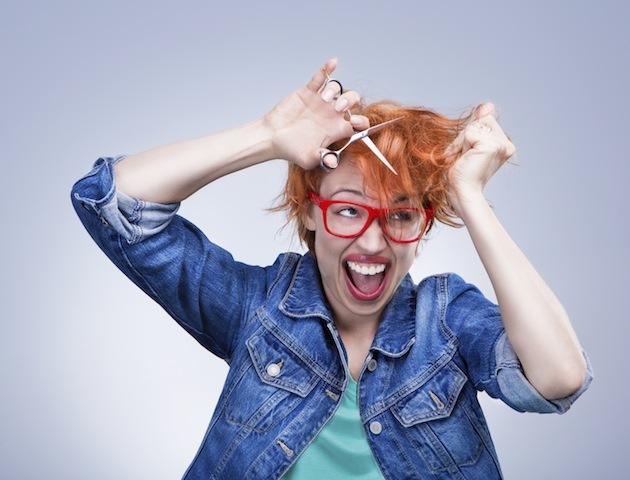 Yes, topping our 11 cringe moments all women have at the hairdressers is the fact your mop’s a matted mess. Dank and lacklustre – which is why you’re here, of course. But why do two days without washing it leave you looking like you’ve not showered for a week? Oh well, it’s part of the service, and their fancy products will make your bonce shinier than ever. Hopefully. 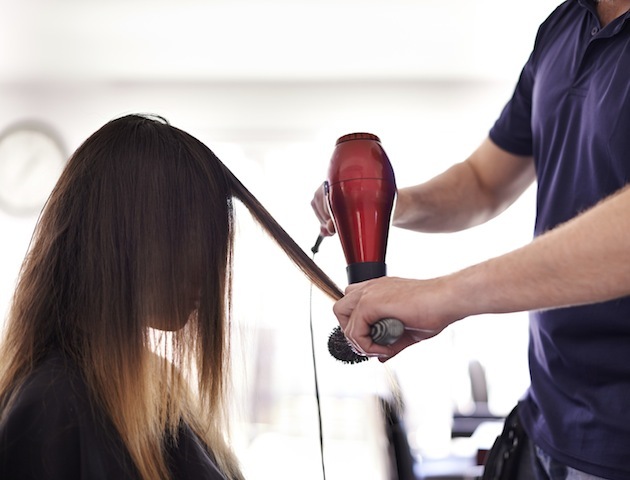 You’re dealing with a professional – it’s an insult to them that you spend zero hours lovingly caring for your hair. You’re here so that they will magically fix it. ‘I just want a couple of inches off, to get rid of the dead ends and have a tidy up…’ you blather. They hate you, you can tell. ‘Yes, but what sort of style are you after?’ they ask, trying to obtain a smidge of guidance. ‘Whatever you think, but I want it manageable at home,’ you add, sheepishly. Right, they decide, this girl’s clearly a troglodyte. Then they send you to be hosed down by a junior stylist. The least flattering of garments, but a necessary evil! Is it on like a coat or front ways like a straitjacket? Whichever you presume, it’s always the opposite. It’s either too big or too tight. Barely waterproof, your shoulders still get soaked and loose hairs are destined to creep down your neckline and itch for the rest of the day. You slip your head into the awkward crook on the sink and then comes the question: ‘Comfy?’ ‘Yes,’ you lie. Staring at the ceiling, you feel ridiculous, and anxious they won’t wash every strand thoroughly. ‘Would you like to try a conditioning treatment?’ they ask. Translation: your hair’s beyond salvation. They know you only visit once every six months, and never apply expensive nourishing products meanwhile. ‘Yeah, great!’ you reply, knowing a tiny squirt will be an added £14 on your bill. Oh well, you’re worth it. Oh cripes, here comes the massage! Does closing your eyes mean you’re enjoying it a little *too* much? Or is it more creepy to keep them open? Closing them, you try to enjoy it… then suddenly it’s over! What a swizz. You slope back to the chair facing the bright lights, and cruelly unforgiving mirror. The bags under your eyes have appeared overnight, you’re certain. It used to be so simple. Now there’s more decisions – wine, beer, mineral water, OJ… what’s the appropriate choice? If you get alcohol you definitely have to tip more. ‘Coffee,’ you reply, knowing it’ll arrive just in time to go lukewarm during your blow dry, when you won’t be able to reach and drink it. ‘Going anywhere nice on holiday this year?’ they ask, breaking the awkward silence. You know they don’t care, they just want their day to go quicker – and hope you tip them well. ‘Not yet,’ you smile, then exchange some pleasantries about where they last went and are planning to go (if your tip money’s good enough). Totes awks. They’re snipping away, chatting about their next major life event while you hope they’re fully concentrating on the task in hand. Is using their fingers to measure the length 100 per cent accurate? Then, you look up to make eye contact and it comes… the gentle head tilt forward with their fingers. Translation: Shut up and keep your head still. It’s done, and your hair’s bouncier than you ever imagined it could be. It’s still your face, though, rather than Jennifer Aniston’s, but you can’t have everything! ‘I love it,’ you smile, and, thankfully, genuinely mean it. Then out comes the mirror to show you the back of your head. ‘Yep, that’s great,’ you assert, despite not having a clue if it’s actually any good. Why do we only ever see the back of our head at the hairdressers! 11. To tip or not to tip? ‘Any products today?’ they ask. No, thanks, you’re juggling three overdrafts as it is. Then they look at you for a fraction of a second longer than comfortable – willing you to hand over a note. You realise all you have in your purse is coins. ‘It’s all I’ve got, sorry,’ you say, meekly, handing over a few £1 coins to barely cover 10%. Adding on coppers would just be an insult. ‘See you soon!’ they chirp, like you’re their new best friend. Yeah, right, see you in another six months… When they’ll have moved on. Then you’ll start the process all over again!